The booklet accompanying this pair of SACDs includes a number of session photographs and also a picture taken at a performance of Gurre-Lieder given by the artists involved at around the time of the sessions. When one looks at the vast choral and orchestral forces packed onto the stage of the Grieghallen it seems scarcely credible that, as the notes remind us, the work began life as a song cycle - for soprano, tenor and piano. The dates of composition are very important when it comes to Gurre-Lieder. Julian Anderson, the author of the notes, points out that Parts I and II were completed during the first phase of composition (1900-03) but that Part III was not completed until 1911. In between Schoenberg’s two periods of compositional activity on the work his musical language had advanced significantly. I believe that almost all the work of actual composition was achieved during what I’ve termed the first phase of work on the score but I must admit I’m unsure precisely when the Sprechstimme section involving the Speaker – ‘Des Sommerwindes wilde Jagd’- was composed; I presume it was during the period 1910-1911. 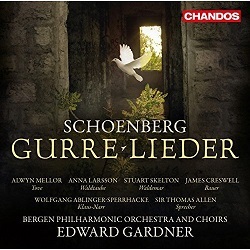 So Gurre-Lieder represents an evolutionary period in Schoenberg’s career. I have the impression that performances of it occur slightly more frequently nowadays than used to be the case but even so they remain fairly rare on account of the vast, not to say extravagant, forces required. It’s significant, for example, that for this project the Bergen Philharmonic Orchestra drafted in reinforcements from Sweden in the shape of colleagues from the Gothenburg Symphony Orchestra. The choral requirements are on a similarly large scale but the choirs have far less to do than the instrumentalists. The tenors and basses are required to sing some passages in Part III but the full eight-part SATB chorus is utilised only in the very last section of the work which in this performance lasts for a few seconds under five minutes. So Schoenberg was seemingly oblivious to economic factors when scoring this cantata and if all this were not enough he does not stint in the matter of soloists. Six are required, but of these four make but one appearance each. The soprano and principal tenor soloists have considerably more to do though we don’t hear from the soprano again after Part I. In the soprano role of Tove Alwyn Mellor makes a fine impression. She’s sung the roles of Brünnhilde and Isolde so she has the vocal resources for Tove. She is rapturous and expressive in her first two solos and in her third and fourth solos I relished the sumptuousness of her voice. I sampled the singing of Susan Dunn on Riccardo Chailly’s very fine 1985 Decca recording (Decca 430 321-2). She sings very well but her voice isn’t as generous as Mellor’s. My other comparison was with Karita Mattila who sings on Sir Simon Rattle’s 2001 EMI recording with the Berliner Philharmoniker (review). She’s very fine indeed. Her singing in the first Tove solo (‘Oh, wenn des Mondes Strahlen leise gleiten’) is radiant and later she matches, and arguably surpasses, Mellor’s sensuousness. On balance Mattila takes the palm for me but that’s not to underestimate the excellence of Alwyn Mellor’s contribution to the Chandos set. I admired Stuart Skelton as Gerontius not so long ago (review). He has many of the great heldentenor roles in his repertoire and recently sang Tristan at the Met (review ~ review). He has a darker, rather heavier voice than some singers that I’ve head in this role – that’s an advantage in some passages, such as the very first phrases that he has to sing. He also has all the heft that you could wish for in the impetuous music of ‘Ross! Mein Ross! Was schleichst du so träg?’ Equally, in the one number that comprises Part II he rages most effectively and when in Part III he rouses his men he does so very strongly. At the other end of the spectrum he displays a fine lyrical side in ‘Du wunderliche Tove!’ I also relished the way he responds to the dark Gothic atmosphere that Gardner and the orchestra create in the introduction to ‘Es ist Mitternachtszeit’. By comparison Thomas Moser, who takes the role for Rattle, seems rather plain and he doesn’t have quite the same vocal strength. Siegfried Jerusalem, who is Waldemar for Chailly – and equally impressively for Claudio Abbado (review) – is by no means lacking when it comes to vocal power but he has a sweeter, more lyrical voice than Skelton. Thus the opening of ‘So tanzen die Engel’ is rather lighter with Jerusalem and he also impresses strongly in ‘Du wunderliche Tove!’ If he doesn’t quite match Skelton’s darkness at ‘Es ist Mitternachtszeit’ he’s still pretty compelling in that section. He’s also well up to the passages in the role that require a big vocal presence. Both he and Skelton bring different, equally valid and important qualities to the role of Waldemar. The third key soloist, even though she makes but one appearance, is the mezzo who takes the part of the Wood Dove. This solo was one of the passages that we sampled in the MusicWeb International Listening Studio when I had my first encounter with this recording. Then I admired Anna Larsson and the intensity with which she sings this key solo. She has a richer voice that Anne Sofie von Otter (Rattle). Miss von Otter is involving – and I appreciate the sorrowfulness that she conveys at the start – though I do wonder if one or two passages in the role are a little low-lying for her. Anna Larsson sounds more at ease with the compass of the role, which she sings with fine feeling and plenty of expression. However, if one turns to Brigitte Fassbaender (Chailly) one encounters something rather special. Fassbaender delivers this solo with searing intensity. She was always regarded as a uniquely expressive singer and this performance is an excellent example of her vividly communicative artistry. The subsidiary roles are all well taken on the Chandos set. Wolfgang Ablinger-Sperrhacke and James Creswell are characterful as Klaus-Narr and the Peasant respectively while it’s good to hear Sir Thomas Allen in the cameo role of the Speaker. Given the length of the work as a whole it’s amazing how very little the chorus has to do. The tenors and basses make a stirring showing as Waldemar’s men in Part III and when the whole choir comes together for the final chorus the sound is transcendent. The orchestral contribution is very fine indeed. The big, dramatic moments are powerfully delivered but what catches – indeed, delights – the ear is the delicacy with which the many almost chamber-like passages come over. Schoenberg’s scoring is often wonderfully subtle and refined and the players do him proud, as do the engineers in conveying the sound of the orchestra. Gardner’s combined orchestra throws down the gauntlet in the Prelude to Part I and they maintain the same very high level of quality throughout the work’s duration. Edward Gardner does a very good job of shaping and controlling this vast score. I’m not sure that I find him quite so convincing overall as Chailly – perhaps at a few points he needed to ‘let go’ a bit more. However, I was impressed by most of what I heard; this score is a prodigious undertaking for the conductor, after all. I like the way he ensures that so much of the copious detail of Schoenberg’s orchestration can be heard – it’s well worth hearing. In that he’s aided and abetted by the engineers. Excerpts from the recording were evaluated in the MusicWeb International Listening Studio a little while ago. At that time we gave a very favourable verdict on the Chandos sound, praising the sumptuousness of the orchestral interlude immediately before the ‘Stimme der Waldtaube’ and describing the sound overall in the passages to which we listened as impressively rich with lots of detail readily apparent. Having had the opportunity to listen to the complete recording at more leisure and on my own equipment I would confirm that verdict with the slight caveat that it took me a little while to find the correct volume setting, such is the dynamic range of the recording. Once I’d done that the SACD sound was pretty impressive both in quiet stretches and in the loud passages such as the overwhelming final ensemble. This new Gurre-Lieder has a lot going for it and is well worth hearing.